A rebate of between $200 and $1000 is being offered towards the cost of purchasing and plumbing a rainwater tank to retrofit into your home for uses such as toilet flushing, clothes washing and for hot water supply. 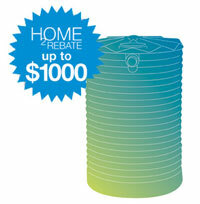 What does the rainwater tank rebate cover? $200 extra for new plumbing by a licensed plumber to supply rainwater to two or more different types of eligible fixtures, and/or an eligible seamless automatic switching device. All rainwater tanks need to be 1,000 litres or more and plumbed into at least one eligible fixture type (toilet cistern, all laundry cold water outlets, or hot water service). Eligible homes are generally homes for which an application for development approval was lodged before 1 July 2006. You must obtain a signed Certificate of Compliance from a licensed plumber indicating which eligible fixture types have been plumbed into. You will need to provide the original receipt when claiming the rebate for the rainwater tank and switching device. Rainwater tanks and plumbing must comply with relevant Australian Standards and any local council requirements that may apply. Tenants will need to provide a letter of permission from their landlord to be eligible for the rebate. Full terms and conditions (including purchase date eligibility) for the rainwater tank rebates are available on the application form. A rebate is generally not available for renovations and extensions as from 1 July 2006, because most new houses and significant extensions or additions to existing homes need to include a rainwater supply as part of the building approval process.